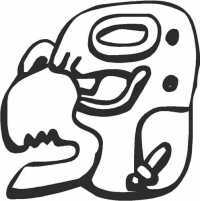 Mayan Symbol (N) graphic sticker/decal. We have tried to identify this symbol and give it, it's correct title. No success so far. If you can identify this symbol, please let us know and we will include it in the desciption with recognition to the identifier.